November | 2016 | Home: Free Sociology! We have some fabulous muckrakers working in Vancouver journalism. For instance, this story about luxury resort living and tax loopholes on Agricultural Reserve Land is really important stuff. Kathy Tomlinson, Ian Young, and a host of other local journalists in the muckraker tradition are doing really great work exposing some of the corrupting practices we see – especially those concerning local real estate. The role of good muckraking journalism is especially important for holding politicians accountable and insuring we get regulations that work and are properly enforced. At the same time, there’s a danger that only doing and paying attention to muckraking moves us toward cynicism. That we think everything is getting worse. Even more maddening: that we can’t do much to make it better. That everyone is corrupt. That all processes are poisoned. That the world is going to hell in a handbasket. Lest we forget: this is basically the narrative that propelled Donald Trump’s campaign and rise to power in the USA. And here’s the thing: it’s false. Other Hans Rosling videos, with more of the data visualizations he’s rightly famous for, can be found here, here and here. To be sure, there are still problems (e.g., Global Warming, Social Inequality, etc.). But we should take heart in how much humanity has accomplished, and move forward in the spirit of doing even better. In many respects, I suppose that makes me a progressive.But it’s more than just a belief. It’s what’s in the data. Progress is definitely the big story we see in terms of things like life expectancy. For most people, life has been getting longer and better. We shouldn’t lose sight of this. Watch Hans Rosling, or play around with publicly accessible population reference bureau data if you want big picture stuff. How does this matter in Vancouver? I see the same general pattern whereby for most residents things are getting better. (For example, BC has the longest life expectancy in Canada. Rents aren’t terrible. [**] Though stubborn, Core Housing Need is down from the 1990s. And millennials are not fleeing the city or metro area in droves). To be sure, we still have problems, and muckraking helps expose these problems. But there’s a danger that if we only get muckraking, we start to think Vancouver is a terrible place to live and it will never get better. We see some evidence of this kind of negative storyline inflecting discussions with young people in Vancouver. This is why it’s important that even as we acknowledge the important role of muckraking, we also need to celebrate Vancouver’s many victories and everyday pleasantries and push back against the idea that it’s a hellhole. Because it’s not. It’s a pretty nice place to live. *This was more or less the theme of my talk on “What we see in the media and what we see in the data” at the BC Non-profit Housing Association meetings in Richmond today. 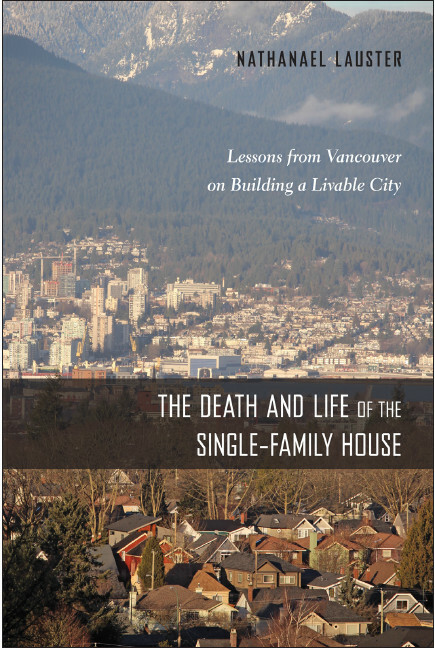 Also, the slides from my talk for the Vancouver Re:Address Summit on Housing and the Future of City Building have now been posted. * The background image is from a photo I took of a lovely mural over on Vancouver’s East Side, where the row of houses just doesn’t quite fit into the urban scene. Funny that. BOOK REVIEW: Choice 54(10) – June Issue (2017) – M. Gunter, Jr.
Roundhouse Radio (The Real Estate Therapist, Sept 30, 2017) – Interview with Joannah Connolly.